Writing this post feels a bit like a plunge into icy water, but I’m going to break the ice and get back to blogging. Laughably, my word of the year was “focus”, but my focus only lasted until February! So here goes with a review of my goals for 2017 and a plan for new beginnings in 2018. It was a terrific year for learning. 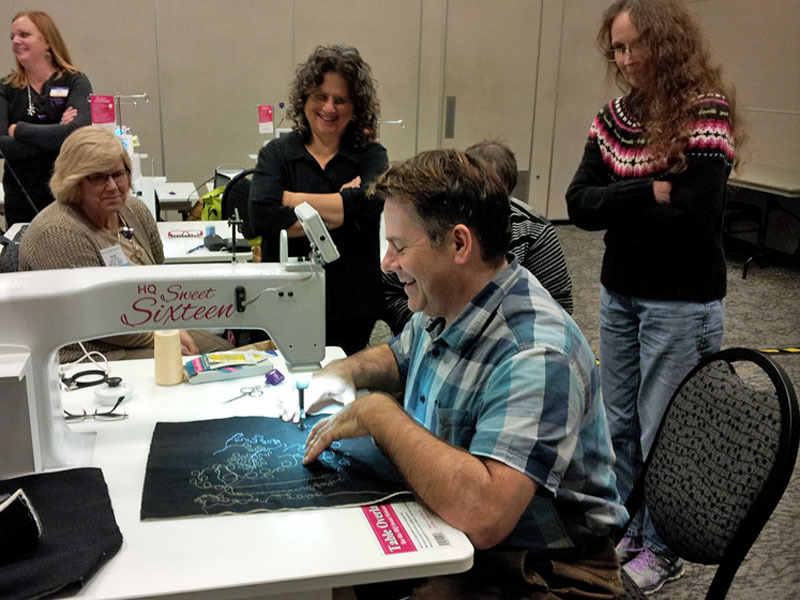 January: A friend and I went to Road to California to take a couple of classes on free motion quilting from David Taylor. I practiced every day for almost two months. It was just beginning to be fun when I fell out of the habit. This will be a priority in 2018. February: The lectures at Quiltcon East in Savannah were informative and I appreciate all those who share their experience and inspiration. March: A trip to LaConner, Washington to view Gwen Marston’s wonderful exhibition was definitely inspirational! April: I loved taking Katie Pedersen’s (sewkatiedid) Psychedelic Baby block class in her wonderful home studio along with Daniela (blockmquilts) from Germany. I treasure the time we spent together and that quilt is currently being hand quilted. July: Maria Shell (talesofastitcher) has a wonderful blog that I have followed for years. 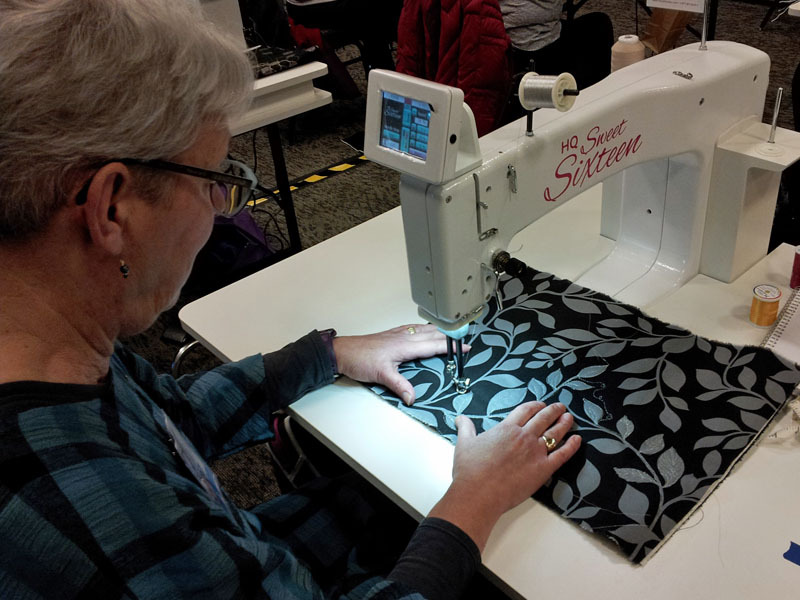 When I discovered that she would be teaching at Quilter’s Affair in Sisters, Oregon, I jumped at the chance to take some workshops. Her improv work is so unique and she is a gifted instructor. I finished a small piece that began in her workshop and I am contemplating how to use the new techniques in my own work. 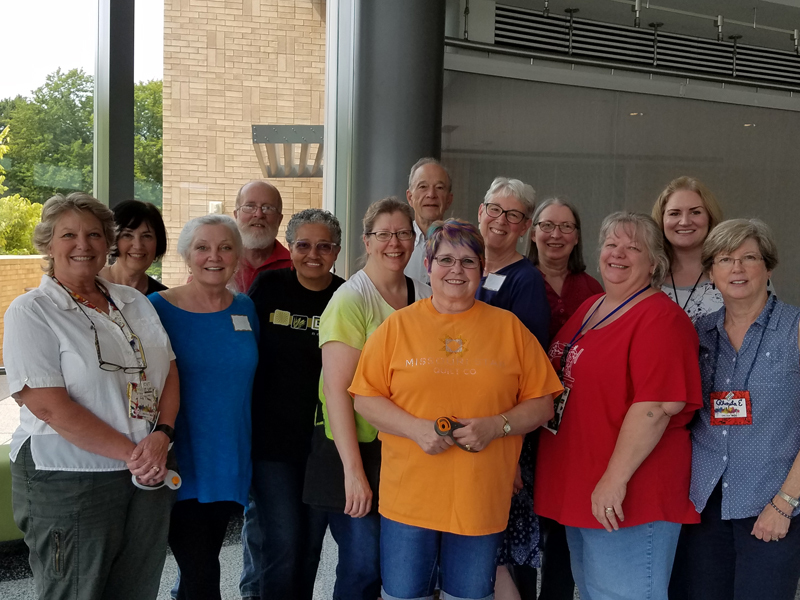 September: At the AQS Fall Paducah show in Kentucky, I was privileged to attend a lecture by Maria Shell and learned more about her journey as an artist. These were all wonderful experiences, but they may have contributed to my difficulty focusing. The creative part of my brain has been just dancing with possibilities! 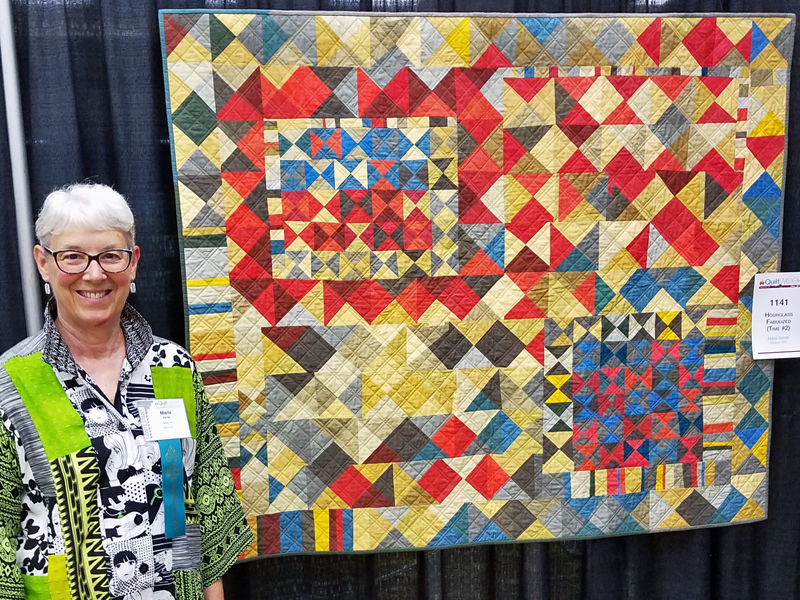 Two quilts exhibited at QuiltCon East in Savannah, “Trestle Nestle” and “jubilant”. It is an honor to have quilts selected and humbling to see them with all the creative work on display. My quilt, “Hourglass Bedazzled” was a semi-finalist in the first Fall Paduchah show. We had always wanted to visit Kentucky, so my husband and I decided to take a long road trip. Our combined love of horses and quilts led us to so many interesting sights along the way. A highlight for me was visiting the International Quilt Study Center and Museum in Lincoln, Nebraska. There I had the privilege of attending a “Behind the Scenes” tour, and met the members of the Lincoln MQG and the regional SAQA group. The Bainbridge MQG had a “Red, White and Blue” challenge to coincide with Bainbridge Island Fourth of July festivities. Our local Surface Design Association group had two main exhibitions this year. These innovative artists are such an inspiration and they use fiber in so many unique ways. The Port Gamble Fiber Festival and the North Olympic Fiber Arts Festival gave me an opportunity to exhibit and to sell my work. Each year I am inspired by the variety of textiles on display and by the innovative work of our local fiber artists. This year I was a vendor at two major events, but also at three smaller venues. I did not explore online sales, but I did begin selling at the Lamb Farm Kitchen Shoppe in Sequim. Okay, here’s where all those classes, traveling and vending took their toll. 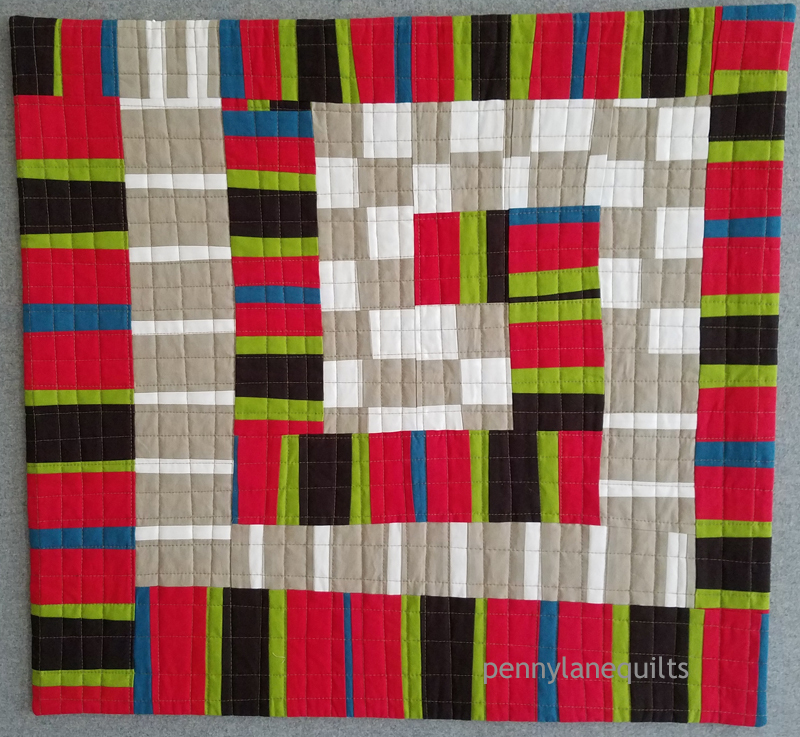 I did not dye any fabric, or finish a major quilt. But by midnight tonight I will hopefully have finished the top for my “squircle a day, 365” project, which has really been fun. (I’ll share more about that in my next post.) I participated in the mini swap at QuiltCon, where I received a wonderful mini from Sandra Kaye @sandieloves2quilt. In February, I donated a couple of blocks to Quilts for Quebec, and I have two quilts finished and ready to donate in the new year. As discussed above…the struggle is real! So here’s to the New Year and my goals for 2018. Many are the same, but I have cut back expectations in some areas to facilitate more production in the creating department! Thanks to this wonderful, supportive community that encourages and supports each other. I appreciate you all. Happy New Year! Our winters are mild, so snow days are a novelty. 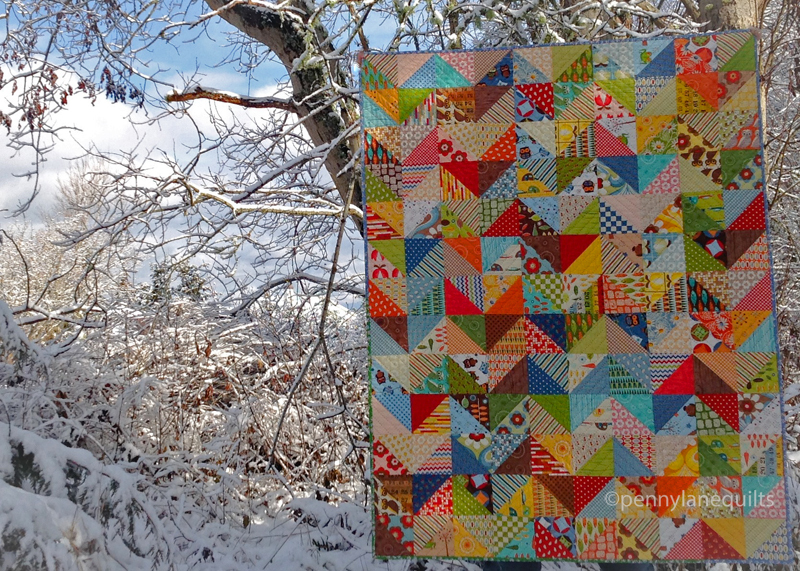 This week I took advantage of a sunny morning and a lovely, snowy backdrop to take a few quilt photos. One of my goals for 2017 is to improve my photography skills. Of course, this means learning how to use editing software. I’m trying to check out some of those helpful tutorials in the process. The photo pictured above was edited for Instagram using a mobile app. This quilt was the last one I completed in 2016. It is my most complex quilt to date that uses improvisational piecing, and I hand dyed all of the fabrics. I don’t think I ever properly documented it, but a few photos appeared on Instagram during the months that it was in process. 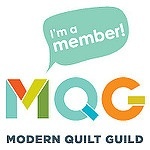 On another note, QuiltCon is right around the corner! Our newspaper, the Sequim Gazette, was kind enough to write an article about the local quilters who will have quilts in Savannah. They even sent a photographer out to capture me in my own environment. Those of you who are curious and have bugged encouraged me to include photos of myself on this site, can check it out. 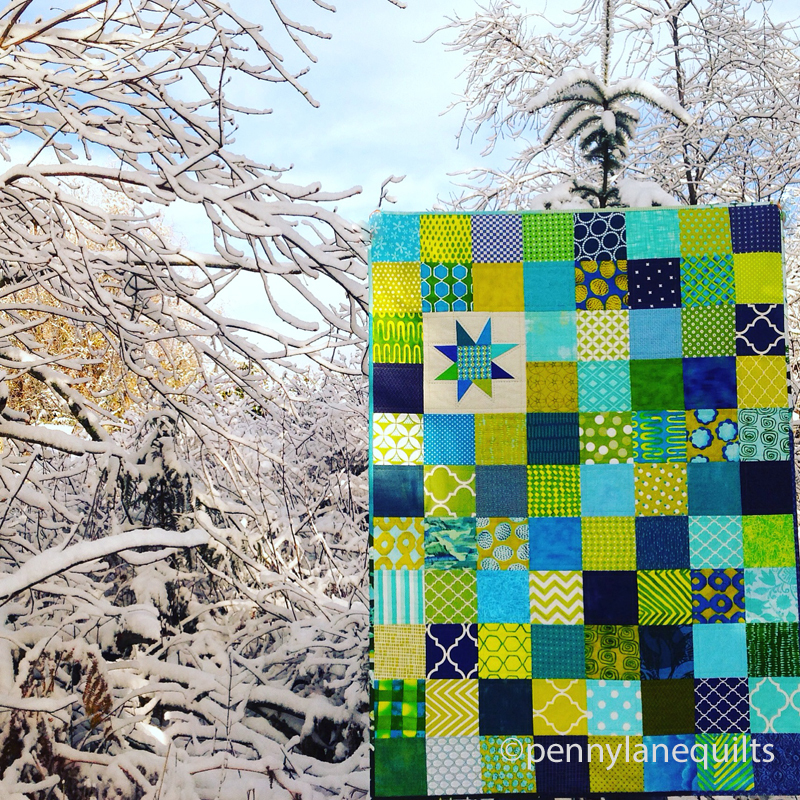 It is snowing again today, so I’m off to curl up with a cup of tea and some hand quilting. I’m on the home stretch quilting the mini for my partner in the MQG swap. My goals for 2017 include learning how to free motion quilt, specifically on our Handi Quilter Sweet Sixteen machine. A few years ago, a friend and I decided to purchase a used sit down midarm. Neither of us had much experience with free motion quilting, but we figured we would just jump in and learn on the new machine. 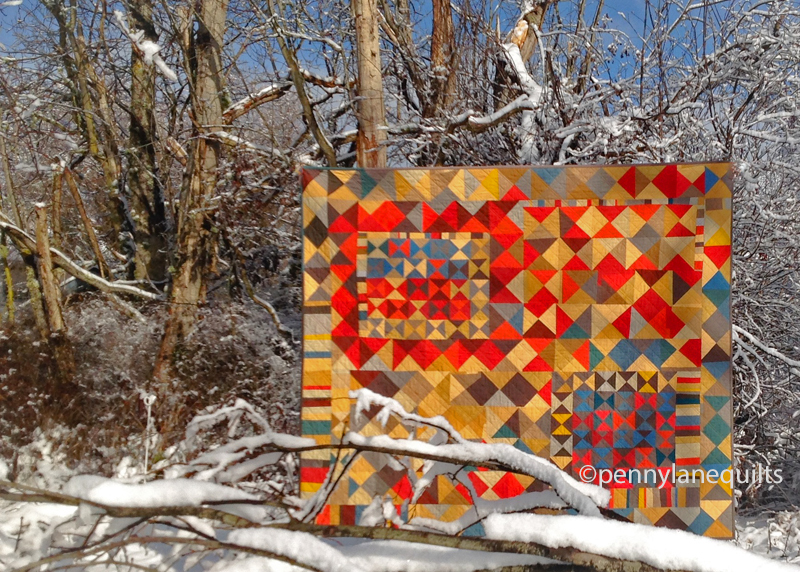 For a few months we practiced, watched videos and quilted a few projects and quilts. However, life “happened”, and our priorities shifted. 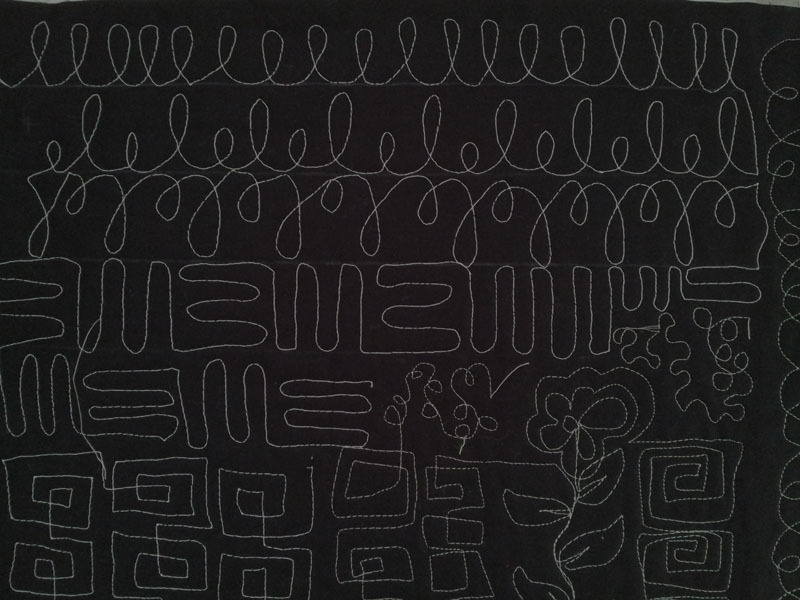 My friend moved away for a year and I focused my energies on my walking foot, straight line quilting. The poor machine sat neglected and unused for about a year and a half. After awhile, I felt a bit intimidated about getting started again. Would I remember how to use the machine? Could I effectively adjust the tension? Was I willing and interested enough to begin practicing again? Then we came across a notice from Road to California announcing that David Taylor would be teaching a couple of classes using HQ Sweet Sixteens. 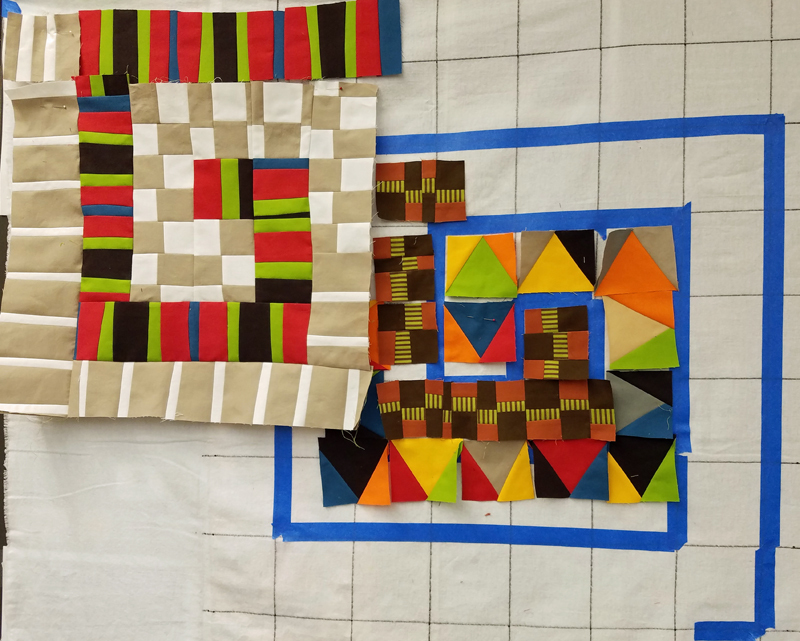 One class focused on finding your own tempo and rhythm for free motion quilting, and the other emphasized using a variety of threads , adjusting tension and choosing needle sizes. Just what we were looking for to ease us back into the process. David’s classes were entertaining and informative. 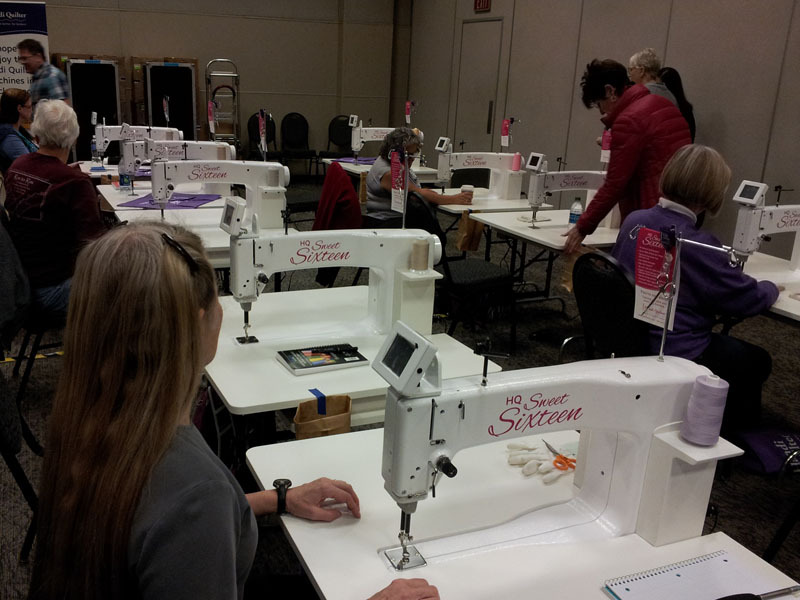 A series of exercises helped us practice techniques, and the Handi Quilter reps were there to assist with the machines. That quick trip to Ontario gave us helpful hints, experience and confidence to come home and get started again. My goal is to spend at least a few minutes each day practicing and to start building muscle memory. 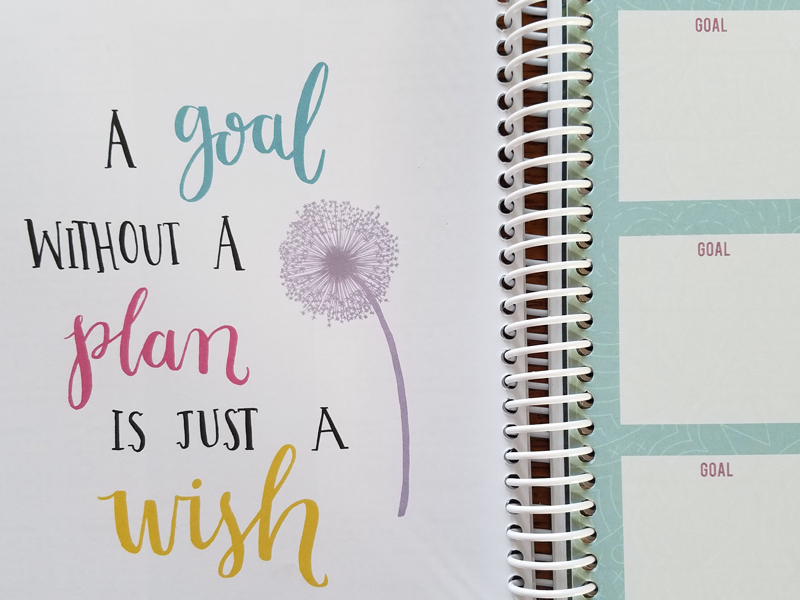 It is one of the daily quilting tasks that I keep track of in The 2017 Quilter’s Planner to hold myself accountable. 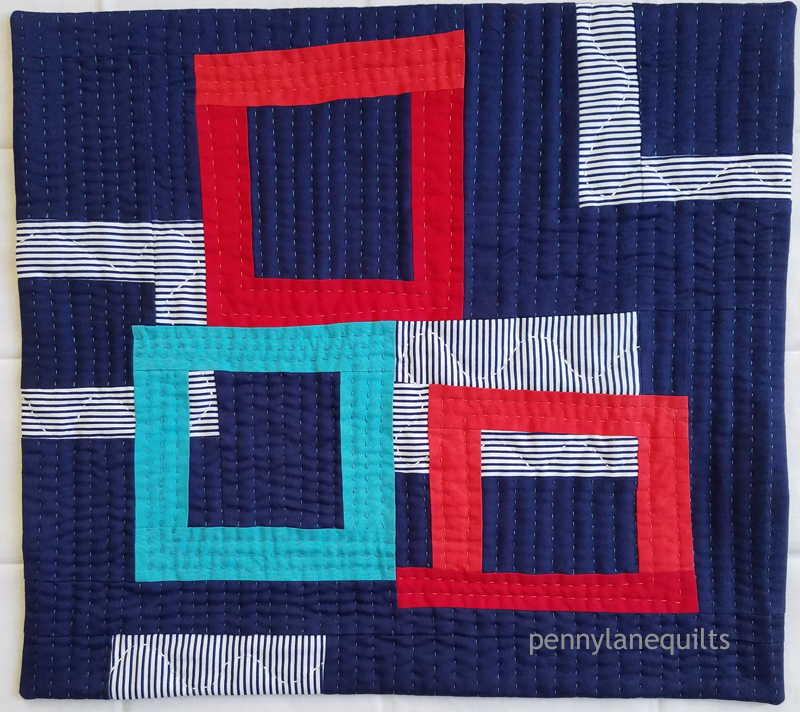 As an added bonus, each week the planner features a fmq motif to practice and Stephanie Palmer @latenightquilter is creating short videos to introduce the designs. I was super excited to see that she demonstrates using a HQ Sweet Sixteen! Each day brings a new opportunity for practice, my confidence is growing and I am actually starting to have some fun in the process! Stay tuned for progress reports. Now it’s time to go practice! I wish I didn’t have to begin another post with, “it’s been awhile…”, but it surely has been a long dry spell without a post! I managed to have more commitments than time this fall. The outcome was that I accomplished a lot, but some of those deadlines were a bit stressful. So, I have been setting priorities and goals for the coming year in hopes of avoiding that particular pitfall. 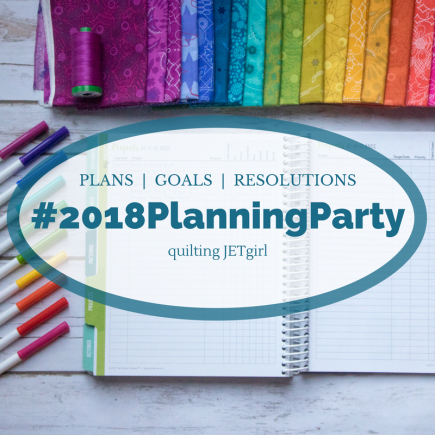 Thanks to Jennifer Strauser @DizzyQuilter for The Quilter’s Planner and extra goodies! In reflecting on my work and personal habits, I see that deadlines help me create a sense of urgency and actually get things finished, but I need to allow enough time and flexibility in my schedule in case life throws me a curve ball. 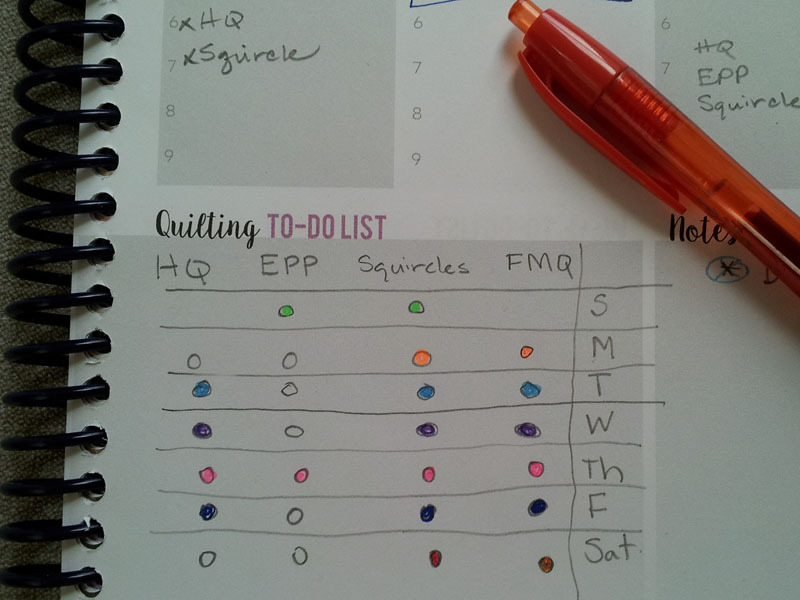 The Quilter’s Planner is the tool I’m using to help me get organized. I’m very excited to have something so beautiful to track my projects, quilt show deadlines, learning opportunities and business events. It was helpful to look back at this year and to see what was accomplished. Now my goals are public and I aim to hold myself accountable! 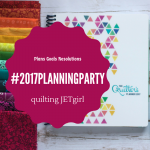 I’m linking up with Yvonne@quiltingjetgirl and her 2017 Planning Party.